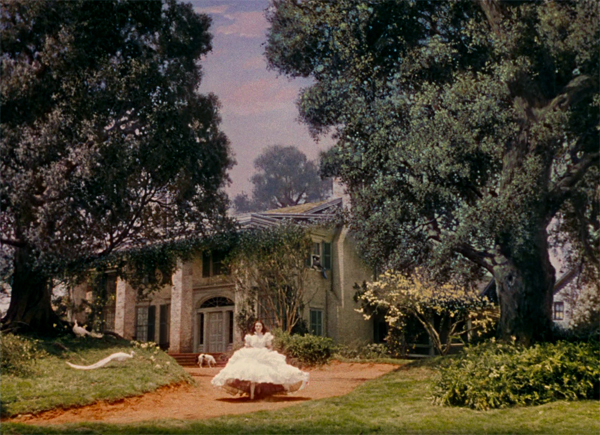 Gone with the Wind was filmed here in 1939 on stages 11 and 12 and many of the outdoor sequences were shot on the backlot which, according to the studio website, used to stretch all the way to the hills. This is where Tara once stood and where Scarlett O’Hara ran through the streets of war-torn Atlanta. 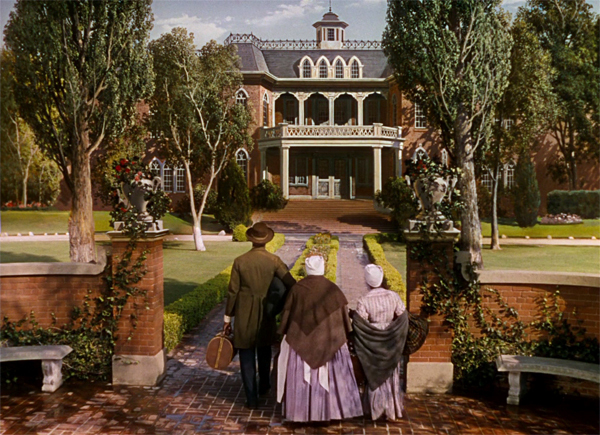 The front of the building was used as the exterior shot of the Butler’s Atlanta mansion in GWTW, with one of William Cameron Menzies’ famous matte paintings disguising the colonial columns. Walking up to the front of the studio was like stepping back in time. Except for the “Culver Studios” sign across the top, it doesn’t look as if the facade has changed much since the golden days of Hollywood. 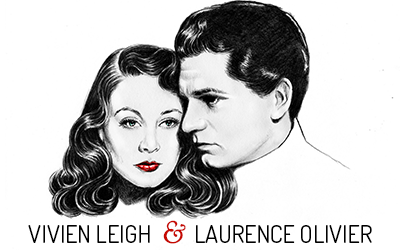 Laurence Olivier was very familiar with this studio, having been under contract first to RKO in the early 1930s and then making Rebecca for Selznick in 1940. 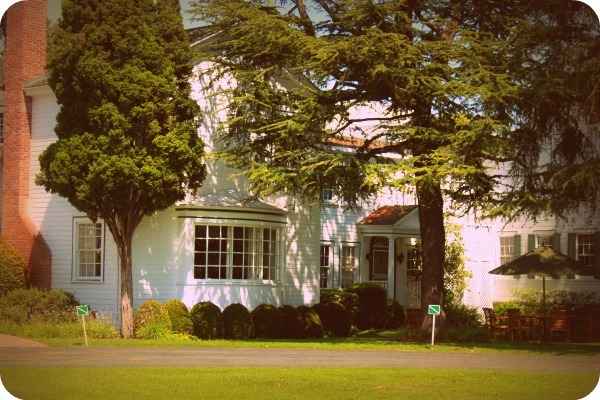 It was easy to imagine stars like Clark Gable (who had been loaned out from MGM, located just a few blocks away), Cary Grant, Vivien Leigh, Gloria Swanson and Lucille Ball driving through the gates to start a day’s work. During my stay in LA, I had the opportunity to visit Sony (formerly MGM) and Paramount, both of which are still enclosed behind large walls and gates, inaccessible to the average passer-by. 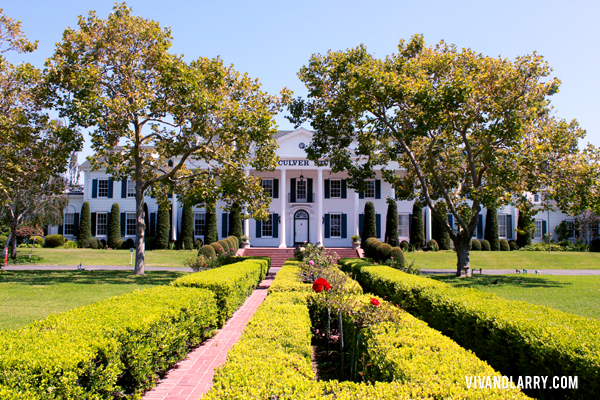 Culver Studios is so open in terms of what can be seen from the street, which is something I really appreciated. It looks just as it does in the movies! Dearest Kendra, thank you so much for this post! I have always wondered whether this building still existed, and now I know, thanks to you, that it does. How wonderful! There’s so much to see in this great documentary “The making of GWTW”, and now you have been there, you go girl! Wish I could have been there with you…. Dearest regards. PS Great to know that Larry too was familiar with this studio. Another great post, Kendra, and fantastic photos of the studio! I’m so glad to see the place in such beautiful condition. Your pictures made me think of 2 references Irene Selznick made to this place in her memoirs (which you definitely need to read if you still haven’t). First, she says that David Selznick drove her by this very spot on their first date, pointed to the white columned studio, and said “That’s the kind of place I’d like to have” (at this point he was still at his first job as an assistant at MGM). Later, after he left MGM for the 2nd time to form Selznick International, Irene relates in her book that she happened to drive him to work on the day that the Selznick name was being painted onto the building, and that they sat in the car watching with tears streaming down their faces, remembering the moment he had first told her of his dreams in connection with this place. Irene remembered this moment as “romantically, the climax of his career” … and it took place just about where you were standing, Kendra. So cool! I really have to get this Irene Selznick book and I know you’ve recommended it several times. That will be my present to myself after I finish my dissertation! Great post, Kendra! I love the fact that you were having your “major geek moment” on the same spot where David O. Selznick’s career peaked (romantically). Hope you have (or have had) a chance to read Irene Mayer Selznick’s memoirs. Aww, bless you for worrying about me. I’m fine, the craziness hasn’t hit my area (and hopefully it won’t). It seems to have died down in London but has spread to other cities. Really senseless and stupid, destroying family businesses, etc. It’s sad. But yes, I’m ok! 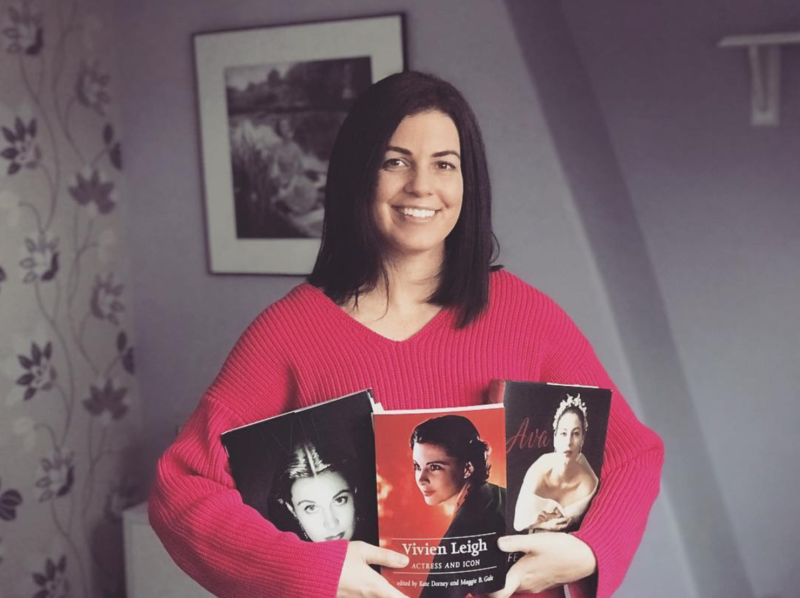 PS: Loved this post about the Selznick Studio so much, as well as the last one with the beautiful pics of you in vintage costume. You don’t happen to resemble Bette Davis (you’re MUCH prettier! ), but when you put her dress on you certainly started channeling your inner Margo! Loved it. I walked on Ince street along the huge soundstages, and found myself in the “business” area behind the studio, where the backlot once was. I climbed up the hill which is nearby (you can see it on many behind-the-scenes pictures of GWTW) and could embrace the whole landscape. I took tons of pictures and afterwards I compared them with various documents I have found on the Net. It was easy to locate every piece of the exteriors (Tara, Atlanta streets, the station, etc…). The huge buildings of the soundstages look quite the same as in the 40’s. 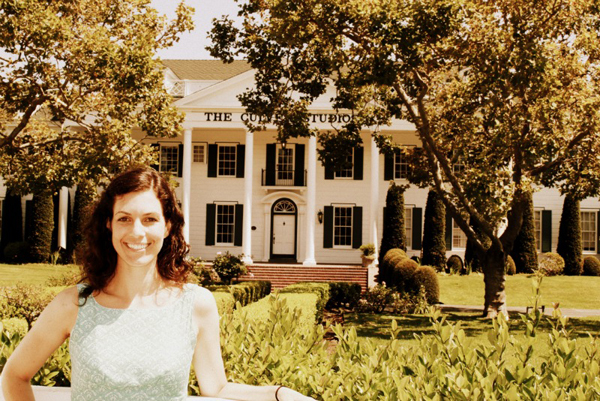 I would have liked to enter the Culver studio, though, and see the soundstages and the small bungalow which was built for Vivien, and which is still there, according to a few pictures I saw. Way to go hiking further afield! I’m glad to hear things look relatively the same after all these years. I think you can do a guided backstage tour. Jay and I asked the guy at the security gate about Vivien’s bungalow but he didn’t know what we were talking about. Figures. Eric, I too was there in 1995 and I thought it was reported that the the “back 40” was torn up long ago in the 1970’s for condos…..Is there that much still left to see? Thanks for the post. Yesterday I went on a search for the site of Tara. I have studied many aerial photographs of the old backlot (from different years). Anyway, I determined that the EXACT spot where Tara stood is now within a warehouse looking building (go to the end of Hayden Place, it’s the building immediately to the right, i.e. to the north). Tara stood on a spot which is now inside the northwest part of this particular warehouse looking building (not sure if it’s a warehouse, but it looks like one). I’m going to visit this warehouse looking building on a weekday and see if I can talk to someone who works there and maybe they will let me look inside the building, specifically the northwest corner area (where Tara stood). 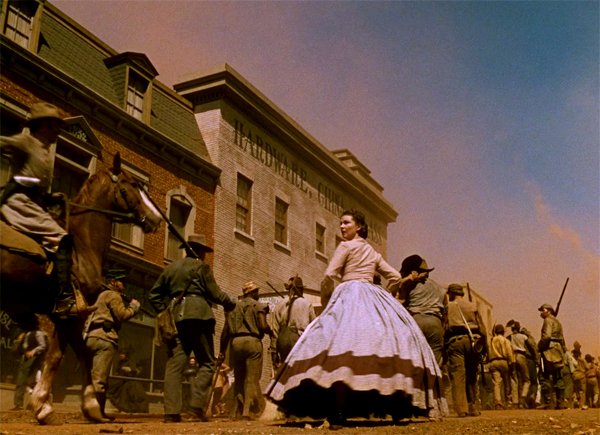 I want to feel the exact geographic spot where Tara stood so that I can connect to the “ghost” of Tara and imagine the Tara scenes from GWTW more deeply and emotionally. I’m with you! I want to go to that exact same spot!!! I wish they’d reconstruct Tara right there. I haven’t read it yet was wondering if you had? Any validity to this book? I heard that it was way out! I sincerely want to thank you for your wonderful “labour of love” on your site. I feel so fortunate you send me these beautifully photographed and well written pieces, etc. Your mighty talented! Congratulations on your graduation and much success in your future! Again many thanks for your passion and dedication to the these gifted, beautiful people who graced the stage and screen. P.S I really enjoyed Kendra’s book on Vivien – finished it not long ago. Wonderful! I shared the video with the fans over at http://www.facebook.com/vivandlarry. Keep up the good work! This August 2016 , We had the opportunity to visit a very unique museum .It is the ” Gone with the Wind “Museum in Cleburne, Texas. The owner has collected GWTW since forever , to the point where her husband had to buy her a building in order to get it all out of their house. It is amazing how many items she has. Everything from coloring books to the original costumes that Bonnie Blue wore and other costumes that Scarlett wore. Well worth the trip to see it.You can even watch the movie while you are there.